Why grabbing this mace is a big deal..
A Labour MP picked up the ceremonial Mace for a form of protest, but why is it such a big deal? "The rod represents parliament’s authority – which the government made a mockery of by delaying the Brexit vote" are the words written by Labour and Cooperative MP Lloyd Russell-Moyle, joining Parliament just after the 2017 General Election, in an opinion piece published in The Guardian. The piece was written by newly-elected politician after he picked up the ceremonial Mace from the Common's table. In order to symbolise the Queen's authority, the ceremonial Mace is carried into Parliament on a daily basis, as long as it is actively sitting. According to official proceedings, Parliament cannot sit unless the Mace is present in the chamber. It is, therefore, considered disrespectful for anyone sitting in Parliament to pick up or attempt to remove the Mace. Amongst Brexit debates, Jeremy Corbyn called for an emergency debate which the Speaker of the Commons, John Bercow, granted. Shortly into the debate, Russell-Moyle appeared to approach the central table of the Chamber before grabbing the ceremonial Mace. 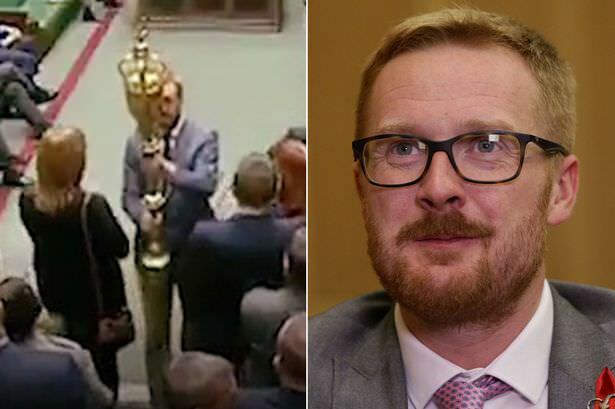 Almost instantly, MPs from both sides of the aisle reacted to Russell-Moyle picking up the Mace, with one shouting "Put it back!" Several Doorkeepers, whose role is the security of the Commons, approached Russell-Moyle with one Doorkeeper taking the Mace out of his hands. She then proceeded to return the Mace onto the table. In response to the Russell-Moyle's actions, Bercow announced that he would ban him from the rest of the day's proceedings, meaning he was allowed to sit back in Parliament the following day. Russell-Moyle tweeted out after the incident "Thankfully they haven’t locked me in the Tower of London but if they had I’d expect May to be in the cell next to me for her treatment of Parliament today. I’m allowed back tomorrow after my symbolic protest against this government, wish May wasn’t allowed back." This isn't the first time that the ceremonial Mace has been taken out of its place by sitting Members of Parliament. In 2009, John McDonnell, the now incumbent Shadow Chancellor of the Exchequer, in response to the Transport Minister announcing approval for an extra runway within Heathrow without a parliamentary debate. McDonnell was heard saying “It’s a disgrace to the democracy of this country." Compared to Russell-Moyle's day ban, McDonnell was banned from sitting in the Commons for 5 days. Do you think Russell-Moyle should've done this? Should he have been banned for longer than a day? Let us know in the comments! he should have been removed from the MP Role. Sorry but #noconfidence is legit in this situatuion. well at least we have theresa May as PM for now. and under the rules no confidence votes can not be issued now for 12 months.